​Edward III died on January 5th 1066 after being king of England for 23 years. A fight began over who would be king. Hadrada was very unpopular, but very powerful. His name alone was enough to strike fear into the hearts and minds of his enemies. The first to try and seize the crown and invade England was Harald Hadrada of Norway. Harald Hadrada landed with a massive army of over 8,000 Norwegians in the North of England. They took York and declared Harald Hadrada King of England. On hearing of the Viking (Norse) invasion, Harold Godwinson quickly gathered what men he could and marched 187 miles north to face him. They marched 37 - 45 miles a day, going as fast as they could and carryng their heavy kit with them. 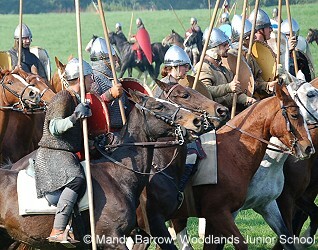 The two armies met at Stamford Bridge, just outside York, on 25 September 1066. It was a bloody battle and one in which Harold's army (the Saxons) broke through the Viking invaders front line to go on and win the battle. 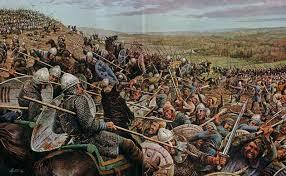 The Battle of Stamford Bridge was one of the most impressive victories any Saxon King ever won. Harold's men killed Harald Hadrada. It was such a fierce battle that only twenty four of the three hundred ships, that came to England carry the 8,000 soldiers, returned to Norway. King Harold's celebrations of victory were cut short as news came of the Norman invasion and no-one was left along the south coast of England to stop them! 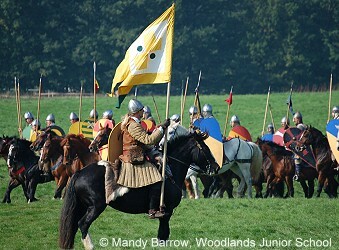 The Saxon army raced back south to face the Norman invaders. The Norman Invasion started when William, Duke of Normandy's 7,000 soldiers landed at Pevensey on the morning of the 28th September 1066. William's army was stronger. He had better trained soldiers and had the use of a strong cavalry (men on horseback) and archers whereas Harold did not. William's army pretended to flee. Many of Harold's men broke their shield wall to chase after them but as they did William and his army turned back and slaughtered them.People believe Harold was killed with an arrow in the eye. Ouch. William became King William I of England.